Max- 35 years as on 18 May 2019. National Trade Certificate in Draughtsman (Civil) Trade. One Year experience in GFRG constructions. 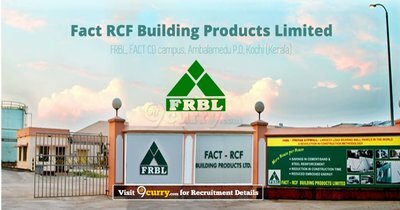 Eligible candidates may send their application in prescribed format to Manager (HR&ADMN) FRBL, Ambalamedu P.O.Kochi, 682303 on or before 18 May 2019, along with true copies of National Trade Certificate, Mark list, experience, age proof, SSLC etc.